Tom Hanks fans ( and who isn’t one? ) know that Victor Navorsky is the lead character in “The Terminal”. One of Hanks’ most beloved characters, Navorsky ( whose character is based on a real-life story ) also serves as the perfect subject matter for a language acquisition study. Since chapter four of the Ear Book just happens to deal with pragmatic processing, it only makes sense to combine business ( this blog is my homework ) with pleasure ( I get to watch a movie ) in the form of a brief-but-in-depth pragmatic analysis of Navorsky as well as his conversational nemesis, Frank Dixon. For the purpose of this blog post, I will define pragmatics as the context in which language is used, including the social framework, the speaker’s and listener’s intentions, and the appropriateness of the language chosen as well as its delivery. Newly-arrived Victor Navorsky gives himself a quick shave in the airport. The movie begins with Victor Navorsky (Tom Hanks) arriving in New York’s JFK airport, wearing a wooly hat and clutching a can of what appears to be Planter’s Peanuts. Navorsky has come from the country of Krakozhia. Through a bizarre twist of fate, his government has been overthrown, its borders have been sealed, and passport and visas from Krakozhia are no longer valid until the “new government” is established. All of this occurred while Navorsky was on the NY bound flight, and he knows nothing of it. It is the duty of the immigration authorities of JFK to inform Navorsky that he will be confined to the airport’s “International Transit Lounge” until the situation is resolved; unfortunately, Victor does not speak English, and there is no Krakozhian translator available. You might think that this is a semantic dilemma, and it certainly is. However, using the Ear Book to assess the pragmatics of the ensuing conversations, it soon becomes clear that even if Victor Navorsky had been able to speak a bit of English, the disadvantages he faced would have made communicative success highly unlikely. Let me begin my assessment with one of the opening scenes from the movie, where Victor is taken into a private room by an airport guard and persuaded to give up both his flight ticket and ( most unwillingly ) his passport. The guard is not a particularly unpleasant or threatening sort of character, but since Navorsky lacks any sense of context, the two are unable to communicate on even the most basic level. What do I mean by “context”, and why is it so important? The Ear Book explains this in terms of “deictic elements“, or the co-ordinates that the listener needs to establish in order to concentrate on and process incoming information. For instance, on a very basic level, Navorsky does not know the identity of the speaker, since the guard has not introduced himself. He does not understand where he is, since he has simply been led into a private room with no explanation. He has no clue as to why he has been singled out, or even what the topic of the conversation actually is. Having no point of reference to relate to, he is at a loss of how to behave socially ( Is he in trouble? Is this part of the “welcome” to America? Is there some beaurocratic detail he has forgotten to attend to? ). At a disadvantage before the conversation even begins, he nervously clutches his guidebook ( Fodor’s ) and begins to sweat visibly. This is a terrible start to any attempt at communication, and the situation moves swiftly from bad to worse. This strange exchange is followed by further confusion, as the guard announces, “I’m gonna need the passport, also…..”, stretching out his hand to take it. Assuming the interview is over and he is free to go, Navorsky happily grasps the guard’s hand and thanks him. Exasperated, the guard finally resorts to pointing and sputtering, “No-no-no-no! THAT! 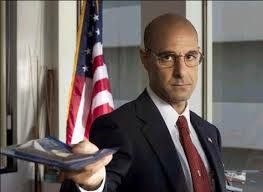 ( points to the passport in Navorsky’s breast pocket) Passport! That!” At last, Victor understands, and slowly draws the passport out of his pocket, stubbornly clinging to it even as the guard, equally stubborn, tugs it away from him. Although the guard assures him, “This is just a standard procedure,” the words mean nothing to Navorsky, who has instantly been stripped of not only his dignity, but his legal identity. Furthermore, according to discourse analysis, he has failed in two respects: he has neither successfully communicated his own message nor successfully comprehended the speaker’s. 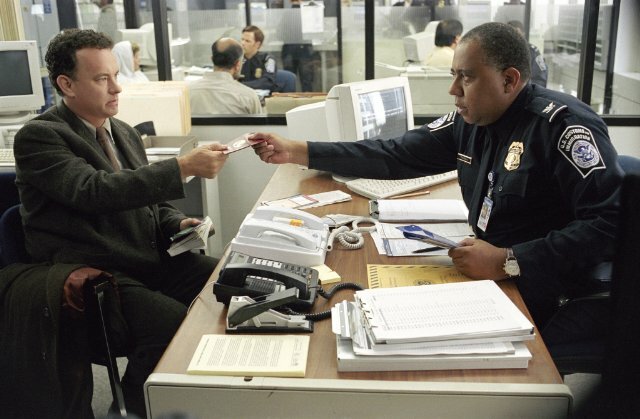 The guard, although he does successfully confiscate Victor’s passport, has not successfully communicated his own message, and is unable to establish the details of Victor’s story. It’s a perfect two-way conversational failure, and there are many more to come. Navorsky reluctantly hands over his passport. Rost states that, “How interlocutors in a conversation define their status relative to the other will determine a great deal about how they will communicate with each other, the style they will adapt in the conversation,” and, in a single status-defining move, Dixon opens his well-stocked shiny metal lunchbox in front of Navorsky and pulls out an impressive array of snack foods. In fact, he is sending a message: I am a very busy and important man (and you are not ), so I must combine my lunch hour with our little interview. Navorsky ( who must be exhausted from his flight and potentially hungry himself ) has no choice but to accept this breach of manners, as he is outranked and lacks “linguistic currency”. With his affective filter steadily rising, he sits anxiously, trying to orient himself to the context of the conversation while grasping for any familiar words ( bottom-up processing ). He is also, incidentally, sprayed with potato chips, in a bizarre incident that adds insult to injury. In analyzing Dixon’s speech to Navorsky, it is useful to refer to Paul Grice‘s conversational maxims (1969) , which are discussed in some detail in the Ear Book. To begin with, there is the maxim of quantity that states ( and the paraphrasing is my own ), “Don’t be a blabbermouth. Say what you need to say, and don’t waste words”. This is difficult for some people even in daily conversation, and Dixon’s challenge is much more formidable. He must explain a mind-bogglingly delicate and complex situation to a non-native speaker in a manner that is succinct and comprehensible. Incredibly, he seems unaware of both the delicacy and the complexity of the information, as well as the linguistic gap between himself and his listener. Biting into his juicy apple with gusto, he rattles on and on, discussing visas being revoked, travelling privileges suspended, military coups occurring, and civilian casualties ( “very few, so I’m sure your family was fine,” he adds, as an afterthought ). When it is clear that nothing has sunk in, the guard adds to the confusion by further elaborating, using phrases like “annexed from the inside”, and “The Republic of Krakozhia”– and at last, a light goes on. “Krakozhia! !” says Navorsky happily, giving the thumbs up sign—it is the single word that he has recognized in the entire speech. Too much quantity, and zero comprehensibility. There is also a conversational maxim of manner, which states, “Avoid obscurity and ambiguity. Don’t go off on a tangent!” I am sorry to say that Frank Dixon is guilty of flouting this maxim as well, in his attempt to explain that Navorsky’s government has been overthrown and his visa suspended. “Currently, you are a citizen…..of nowhere!” he announces. And then “nowhere” reminds him of one of his favorite TV shows: The Twilight Zone. “Yeah, it’s like the Twilight Zone. Do you get that show over there?” And as Navorsky sits in puzzled incomprehension, Dixon goes on to name characters from the show, at one point being corrected by the guard, who is also a science fiction fan. At this point Navorsky has completely given up on attempting to follow the conversation; his level of engagement has dropped off the charts and he has redirected his mind to his own personal goal, which is getting into the city. His response, therefore, to the Twilight Zone digression is, “Where do I buy the Nike shoes?” Hey, that’s getting to the point. No tangents for Navorsky! A close-up of the villain. A third conversational maxim is that of quality. Basically, it states, “Don’t Lie. And don’t go around spouting nonsense that you can’t back up with facts and evidence.” Although Dixon doesn’t outright lie to Navorsky, I say he’s guilty of flouting this particular maxim by the very smugness of his manner, which exudes a kind of sinister normalcy. His continual smirk, along with condescending attempts at humor and the enthusiastic apple-crunching, send a signal to Navorsky that what’s happening is no big deal. “A bit of bad news” is how he puts it. In fact, it is a very big deal, and Dixon himself has never dealt with such an unusual situation. When he assures Navorsky that, “I’m sure that Uncle Sam will have this all sorted out by tomorrow…”, he is certainly guilty of providing false assurance, since he has no idea how or when the problem will be resolved. I say he clearly flouts the maxim of quality, and sets himself up as the villain from the movie’s very first scene. How on earth will the vulnerable Navorsky do battle with Dixon, who appears to have all the pragmatic advantages? By fighting fire with fire, and flouting a maxim as well, that’s how! Though he is unaware of doing so, Navorsky continually ignores the maxim of relevance, which means ( as you would expect ) that his conversational responses seemingly come from outer space, bearing no direct connection to the questions asked. Since Navorsky cannot comprehend the stream of language directed at him, his replies are what the Ear Book refers to as dispreferred responses: they do not comply with the speaker’s expectations, and, in fact, have great power as a tactical weapon. Rost writes that, “By flouting the maxim of relevance, the speaker may derail the interlocutor’s intentions”. This truth is brought to life as time and again we see that Navorsky’s innocent but inappropriate responses have the power to irritate, and even infuriate, the pompous Dixon, who is unable to steer any conversation toward a successful conclusion. Navorsky, an inherently well-mannered fellow, is also skilled at backchannelling ( the comments, noises, or physical signals that signal a listener’s reception and comprehension of a message ). While Dixon pontificates, Navorsky smiles pleasantly, nods, and repeats, “yes, yes” in a polite feigning of comprehension. This, too, unnerves Dixon, when it soon becomes apparent that Navorsky has not, in fact, understood a thing. And so, from the first ten minutes, the scene is set for an ongoing confrontation between two men who have not just different native languages, but differing social ranks and communicative roles, differing schema, differing conversational purposes, and differing styles of communication. Those of you who have seen the movie know that in spite of his disadvantaged position Navorsky wins the day, managing to acquire an impressive level of communicative English while setting up housekeeping in the airport. He even wins the heart ( though not the hand ) of the ravishing Catherine Zeta-Jones. Dixon, on the other hand, comes perilously close to a nervous breakdown, eventually admitting defeat–gracefully but somewhat unconvincingly–and allowing Navorsky to leave the airport terminal to complete his personal mission involving the empty can of Planter’s Nuts. There are a myriad of hilarious and enlightening conversations throughout the movie that beg to be analyzed, but in the interest of brevity ( again, the maxim of quantity ) , I will halt my own analysis and encourage those who are interested watch the movie for themselves. The moral is that communication is not so much about “speaking the same language” as it is “being on the same page”. If you want true communication, it’s a two way street; you and the listener must align your goals and expectations from the start, obey the conversational maxims, check for comprehension and provide constant feedback, and behave as respectable human beings, so that no-one’s dignity is trampled and no face is lost in the process. If all else fails, smile sweetly like Victor Navorsky, tell the speaker you’ll wait, and give it another shot tomorrow. In the meantime, here’s the trailor. Dr. Jim’s–he said we can call him whatever we want– third class was about semantic processing. For me, it was all about the drama of everyday communication. For instance, you think you’re just chatting with a friend, but actually you’re uttering intonation units referring to either given information ( which you assume is currently active in the listener’s memory ) or new information ( which might in fact exist in the speaker’s working memory, but you assume is NOT currently active ). This is interesting, but not so amazing. What’s amazing is this: according to chapter 3 of the Ear Book, we signal whether information is given or new by using our voices, with rising tones signalling given, or background information, while falling tones signal new, or focal information. After testing this in class by attempting to tell Hiroko a story involving facts she knew ( about my daughter, Sumire ) and facts she didn’t yet know ( about my cousin Cathy ), both of us decided that if such tone variance exists, it must be extremely subtle, and difficult to consciously reproduce. Try it and you’ll agree. And since the topic of communication is far from exhausted, let’s continue with “types of understanding”, six of which are neatly analysed by Rost. From a linguistic point of view, it’s all about how our schemata match up. The best case scenario would be complete understanding ( the listener activates schema that are completely shared with the speaker ), and the worst would be not a “mis” understanding, but a non-understanding ( the listener cannot activate any schemata at all to understand the speaker ). A misunderstanding, then, is when there’s a mismatch between the listener’s and the speaker’s schemata. 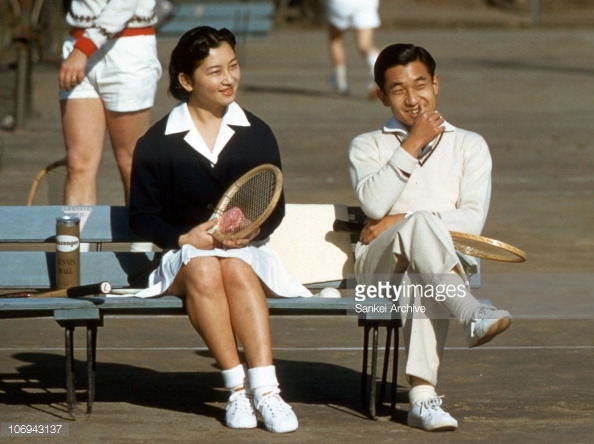 Here’s an example: before my husband and I were married, he took me on a trip to a resort town in Japan called Karuizawa. “It’s just like camping out in the forest!” he said confidently, sure that I would love it. My “camping” schemata activated, I pictured nothing but trees and worried that we did not have the proper gear. But no worries–when we arrived, I saw that Karuizawa was full of fashionable women in white tennis skirts, bars and restaurants, and even an amusement park! “Just like camping” for my husband meant that it was a cool, pleasant place to relax away from Tokyo. He had actually never been camping in the wild, and our schemata were wildly mismatched. There are also degrees of partial, plausible, and acceptable understanding, depending on how much overlap is shared by the speaker’s and the listener’s relative schemata, but let’s return to the state of complete understanding. We all have friendships where communication is so easy it’s like play; according to prototype theory as explained in the Ear Book, this is because we share common activation spaces in our memories. No two friends can share exactly the same schemata, but two friends who share similar world views can easily understand and empathize with each other because they share a similar neurological programming. And when the speaker’s words activate relevant knowledge in the listener’s memory, there’s actually a cognitive commitment involved, which produces an empathetic response and further connects speaker and listener. We don’t just listen to our best friends, we make a cognitive commitment, and I like that thought. As a matter of fact, some of my classmates are not so thrilled with all the detail in the Ear Book. I can understand why it makes some folks tear their hair, but so far I’m liking it. I enjoy picking things apart and breaking down concepts, and it looks to be a steady diet of this kind of reading until mid-book, when it gets “more practical for teachers”, according to Dr. Jim. The next chapter I’ll be writing about is on pragmatic processing, which looks to be pretty juicy. If it’s not, I’ll do my best to spice it up, so no worries. Good night, from the Godzilla Hotel in Tokyo (really! ). As basic linguistic functions develop, they become confined to progressively smaller areas of neural tissue, a process called neural commitment. This leads to a beneficial increase in automaticity and speed of processing, but it also results inevitably in a decline in plasticity……It appears that the process of neural commitment leads to a neural separation between different languages in bilinguals and second language learners. The plasticity or neural flexibility required for language reorganization declines progressively through childhood and adolescence and may be the primary cause of some of the difficulties that adults face in second language learning. What this means to me is that we do lose plasticity as we age, but hey, it’s a trade-off: we gain automaticity and speed (which means greater fluency). That’s pretty important, and actually a good consolation prize; whether the fluency referred to is in one’s mother tongue or in multiple languages, our brains are wired toward fluency, and decline in plasticity is simply an unfortunate result of that process. I also like the image of bilinguals’ different languages as being neurally separated ( like an obsessively neat person’s sock drawer, I imagine ). Mothers of my students would be relieved to know this, since many of them imagine English as something that will interfere with their child’s Japanese learning process ( imagine all the socks unballed and in a colorful mess in the drawer–that’s what they envision ). My husband and I are both late and successful second language learners who raised two fully bilingual children; between the four of us, we’ve had no trouble using either Japanese or English or mixing the two when necessary. The different language systems are firmly established in our minds; they don’t interfere with each other and they often combine to make for a more colorful style of communication. On to chapter two of the Ear Book, which reveals that a linguist’s favorite snack is full of Perceptual Goodness. No, not really, but that’s the first thing I thought when I saw the phrase used on page 27: it sounds like a TV commercial. Actually, it refers to sound. I learned that phonemes have “identities” that clearly define them, as follows: “…..each individual phoneme of a language has a unique identity in terms of frequency ratios between the fundamental frequency of a sound…and the frequency of the sound in other harmonic ranges.” So, as I understand it, in pronouncing certain phonemes we are unconsciously manipulating sound frequencies. Although there’s a broad range of acceptable ratios between frequencies for each phoneme, if we move out of that range, the phoneme loses its identity (becomes unrecognizable or unintelligible). In other words? When a non-native speaker’s pronunciation is so far off that the listener can’t decode certain words, it’s a matter of mathematics. The ratio of the sound frequencies produced by the speaker is mismatched (not purposely, of course), and the listener must resort to guesswork or hypothesis (top-down processing) to comprehend what’s being said. It’s a very physical explanation for what defines phonemes and how we identify them. There are numerous blog-worthy topics detailed in chapters one to three of the Ear Book, but I particularly enjoyed thinking about Schemata. That’s one of those words that we’re familiar with, but perhaps in a fuzzy way. Well, no more fuzzy thinking now that I have Rost’s definition to work with. Here it is: “A schema is a figurative description for any set of simultaneously activated connections (related nodes) in the vast frontal cortex of the brain.” Schemata, then, refers to a set of “memory nodes” that are activated constantly as we attempt to understand the world around us, make decisions, and communicate with others. Read the morning newspaper? You’ve probably created a new schema by processing new facts and linking them together. Just met your new neighbor and exchanged greetings? In that short time, you’ve put a simple schema in place. Even more interesting is the fact that our existing schemata are constantly being undated as we read more, see more, hear more, experience more, and revise our former schema. In linguistic terms, this is being “parsimonius” (following the principle of Occam’s razor), since it is obviously a pain in the neck for your brain to be constantly creating entirely new schemata, and updating is much more efficient. I’m fairly certain that my mother-in-law is constantly updating her schemata in regards to me, her son’s American wife. And that is for the good, since her first schemata was rather alarming and not at all positive: the image of an American bride (she has since confessed to me) triggered fears of early divorce, wild and crazy spending, and greasy, unhealthy cooking. And that is enough reflection for now. I vow to not let my schemata get rusty, but to continue updating and creating nice shiny new ones.